Europe is filled with fishing sites so that anglers would never run out of options for spring fishing destinations here. These fishing sites have been discovered and used since ancient times and in fact their presence may have led to many great civilisations. Western Ireland has loughs and rivers that are abundant with wild brown trout, sea trout and Atlantic salmon. Go fishing here while having a drink of their famous Guinness beer. The ideological barrier known as the Iron Curtain kept many people from being able to touch the Arctic waters in the northernmost part of the continent. But today the peninsula has become an excellent spot for salmon fishing. County Donegal is one of the most untouched places in the continent and there are spots here that are perfect for sea trout or salmon fishing. The welcoming nature of the locals also make the experience even more enjoyable. If you’re interested in deep sea fishing, then you have to head out to the Canary Islands which are popular sport fishing destinations. The climate is great all year round, and it is especially nice in spring. You can catch Bluefin tuna, Blue marlin, Yellowfin tuna, and a whole lot more here. Spain is a beautiful country and this is particularly evident in Barcelona. The Mediterranean climate in the city makes it ideal for fishing and you can catch Bluefish, Mahi Mahi, Big Eye Tuna and many others. This town is a well-known port and is home to powdery white sand beaches and plenty of marine life. Big game fishing aficionados and anglers often come here all year round to catch Bigeye Tuna, Grouper, and Blue Marlin. Enjoy a fun day with friends and hire a charter boat and who knows, you just might catch a big one! This is one of the major fishing grounds in Europe. Go to the Loch of Harray and the Loch of Stenness to catch bass, salmon, shark, cod and hake. These tiny islands give you plenty of opportunity to catch tuna, shark, wahoo and blue marlin. Most people visit the Alps for skiing but in spring, you can actually catch some fish in the blue and green lakes in this very picturesque part of Switzerland. The streams and rivers in the northern part of Italy are a popular destination for fly fishing adventures. Make sure to drop by if you are ever travelling to Italy. If you love fishing and want to indulge in your favourite past time this spring, make sure to check out the list we’ve made. 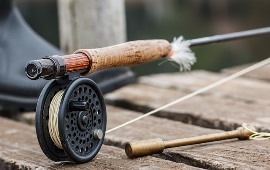 And don’t forget to purchase anglers travel insurance so that you are covered in case you are injured or need emergency medical attention during your holiday.